North Koreans bow in front of bronze statues of the late leaders Kim Il Sung, left, and Kim Jong Il at Munsu Hill in Pyongyang, North Korea, July 27, 2015. These two bronze statues were created by artists from Mansudae Art Studio. With somewhere around 4,000 artists and staff, the Mansudae Art Studio, a huge complex of nondescript concrete buildings on a sprawling, walled-off campus with armed guards in the heart of Pyongyang, churns out everything from watercolor tigers to mosaics so large they seem to depict a race from another, taller planet. But its statues — the really big, bronze, monumental ones on foreign shores — are what appear to have caught the attention of the U.N. Security Council. In one of the odder items on the list of things North Korea can't export under U.N. sanctions, statues were explicitly listed for the first time last month when the Security Council approved a raft of punishments in response to Pyongyang's latest nuclear test, which it conducted in September. To those familiar with the North's exports, the move to ban statue sales wasn't entirely a surprise. It's one of the few things other than coal and natural resources, exports of which were also heavily restricted under the new sanctions, that North Korea can still find a market for abroad. Moreover, sanctions advocates and proponents of isolating Pyongyang for its nuclear program believe Mansudae, and particularly its export arm, Mansudae Overseas Projects, is being used to quietly maintain, expand or obfuscate the nature of its relations with other countries. Africa has traditionally been Mansudae's prime export market — it's sold to 17 African countries, ranging from Angola to Zimbabwe. Pyongyang began exporting statues to Africa in the late 1960s, when a wave of independence movements created a new market of ideologically friendly leaders in search of grand symbols to bolster national identity and claims of political legitimacy. North Korea, looking to expand its diplomatic ties vis-a-vis rival Seoul, initially provided the works for free. It only started selling them about 2000. In July, Namibia terminated the services of Mansudae Overseas Projects after U.N. monitors claimed it was involved in several military construction projects. Namibia had been a regular Mansudae customer, including the project to build its State House, which was completed in 2008. But, on the bright side for Pyongyang, last December a $24 million museum with a huge indoor historical panorama built, designed and largely funded by Mansudae was opened near Cambodia's ancient Angkor Wat temple complex. Unlike other projects by Mansudae abroad, it will collect proceeds from entry fees for the museum's first 10 years of operations, or until it has recouped its investment. The museum hasn't drawn many tourists. The U.N. statue sanctions won't likely hurt North Korea's coffers much. The North's total income from selling statues abroad has been estimated at about $160 million, or only about $10 million a year. That's compared with the estimated impact of the new restrictions on coal exports, which the U.S. has said could cost Pyongyang as much as $700 million. Even so, it's a slap at one of North Korea's most venerable cultural institutions. A man pulls weeds on the lawn at a garden of the Mansudae Art Studio in Pyongyang, North Korea, June 20, 2013. Mansudae was created in 1959 by Kim Il Sung himself. 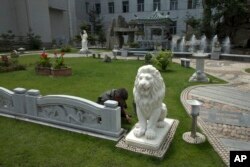 It has generated an estimated 38,000 statues and 170,000 other monuments for domestic use and, according to the website of its overseas representative office, it is divided into 13 creative groups and seven manufacturing plants and has more than 50 supply departments. Statues, mosaics or paintings of “eternal president” Kim Il Sung and his son, “dear leader” Kim Jong Il, grace virtually every large plaza, village center, significant factory and meaningful nook or cranny in the country. At the order of North Korea's third leader in the Kim dynasty, Kim Jong Un, the studio rushed this year to make sure every province had a Kim Jong Il statue to stand beside his father. Kim Jong Un is not yet the object of similar immortalizations or of the pins that all adult North Koreans wear over their hearts.